277. MSFC Engine Prog. Off., Semiannual Prog. Report, July-Dec. 1965, p. 21. 278. MSFC Saturn V Prog. 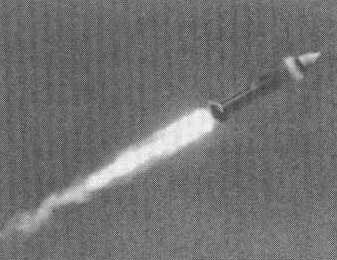 Off., Saturn V QPR, Oct. 1-Dec. 31, 1965, p. 34; MSFC Saturn Flight Evaluation Working Group, Results of the First Saturn IB Launch Vehicle Test Flight AS-201 (MPR-SAT-FE-66-8), p. 13. 279. Exec. Off. of the President, Report to the Congress from the President of the United States, 1965, p. 12. 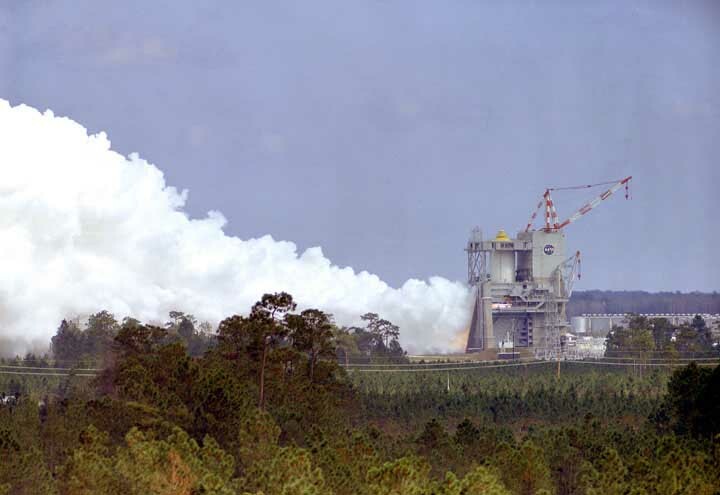 A ground-test (battleship) version of the S-II, second stage of the Saturn V, was static fired at Santa Susana, for 354 seconds in a successful January 12 test of its engine-gimballing and LOX cutoff systems. 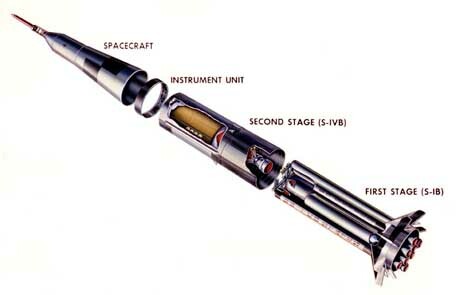 Saturn V milestones on January 13 involved the first stage and instrument unit. 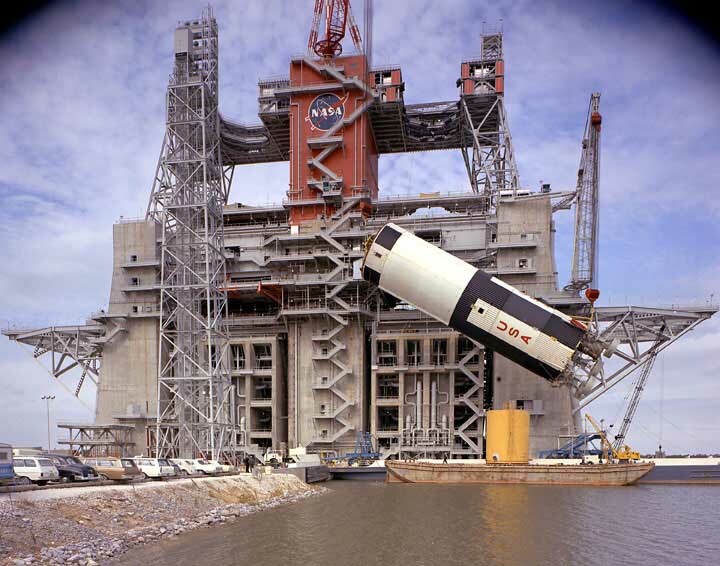 The S-IC-D booster went into the dynamic test stand at MSFC on this date, and NASA awarded a $4,183,066 modification to its existing Saturn V instrument unit contract with IBM's Federal Systems Division, Rockville, Maryland. The modification was for manufacturing "redundant switch selectors." 280. MSFC Press Release No. 66-1, Jan. 3, 1966. 281. NASA Hist. 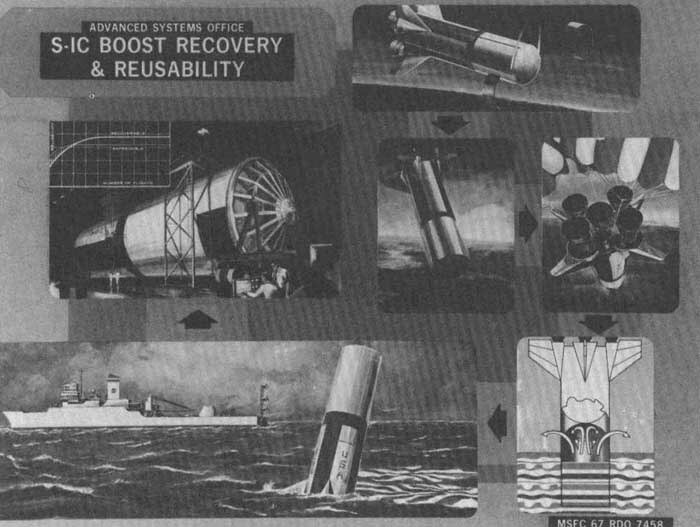 Office, Astronautics and Aeronautics, 1966, SP-4007, p. 16. 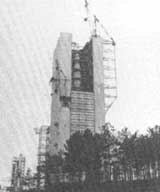 Removal of the S-IC-T from the static test tower on January 20 at MSFC concluded the S-IC-T planned test program at Huntsville. 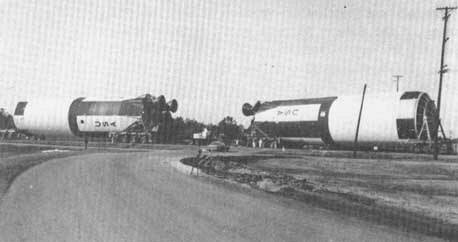 MSFC moved the booster to the Manufacturing Engineering building for storage and later conversion to the functional configuration of S-IC-4. NASA announced on January 20 that the hydrogen-fueled J-2 rocket engine had successfully completed a series of qualification tests to demonstrate performance over its design operating range. These qualification tests ended when a single engine operated successfully 30 times for a total firing time of 470 seconds. 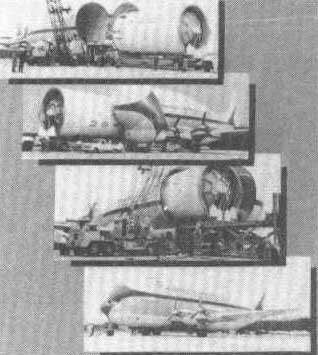 This accumulated duration was approximately eight times as long as the engine would be required to operate in flight. 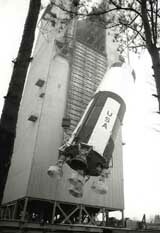 A full-duration (2.5-minute) test for the fourth S-IB booster (S-IB-4) occurred at MSFC's East Test Area facility on January 21. 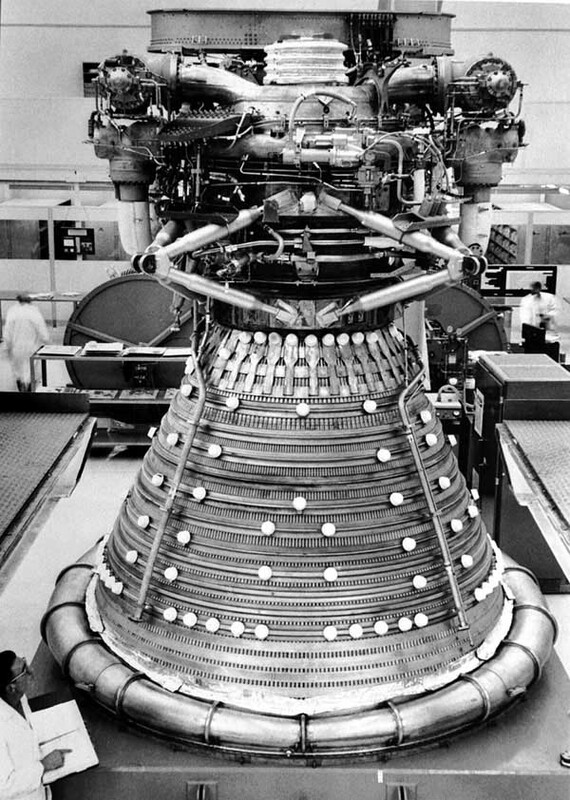 Chrysler had conducted an earlier test of the engine, but for only 35 seconds. 282. MSFC Saturn V Prog. Off., Saturn V QPR, Jan. 1-Mar. 31, 1966, pp. 12 and 38. 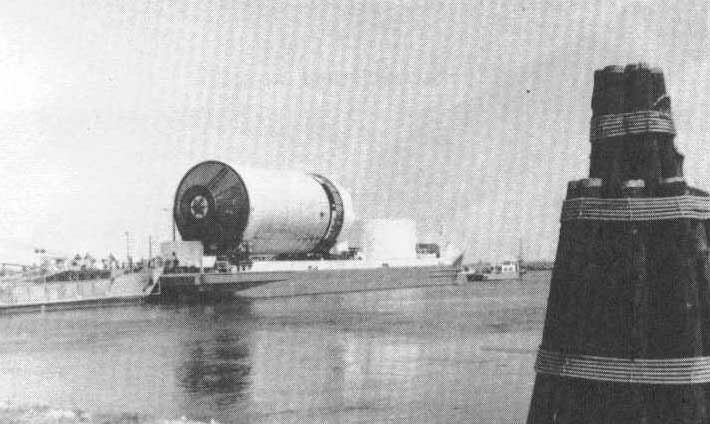 MSFC announced on February 2 that two S-IB flight boosters were aboard barges, one en route to the Michoud Assembly Facility and the other one to the Kennedy Space Center. 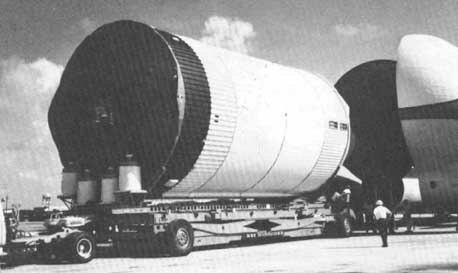 NASA's second Saturn IB flight booster S-IB-2 was due to arrive at KSC within a few days aboard the barge Promise. 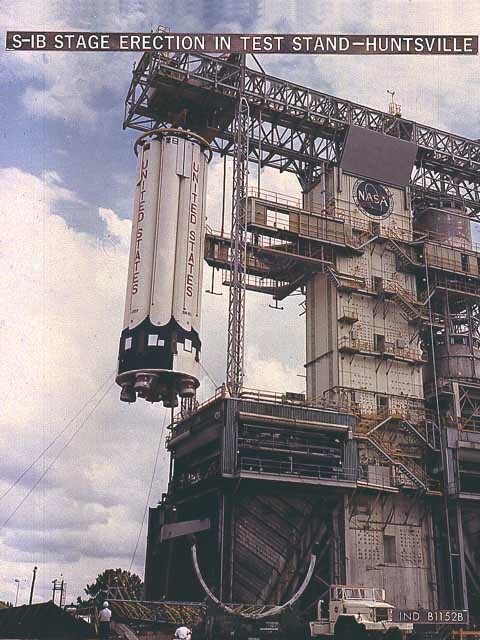 The first S-IB vehicle, AS-201, meanwhile, was awaiting launch at KSC. 283. MSFC Saturn V Prog. Off., Saturn V QPR, Jan. 1-Mar. 31, 1966, pp. 18, 25, and 39. 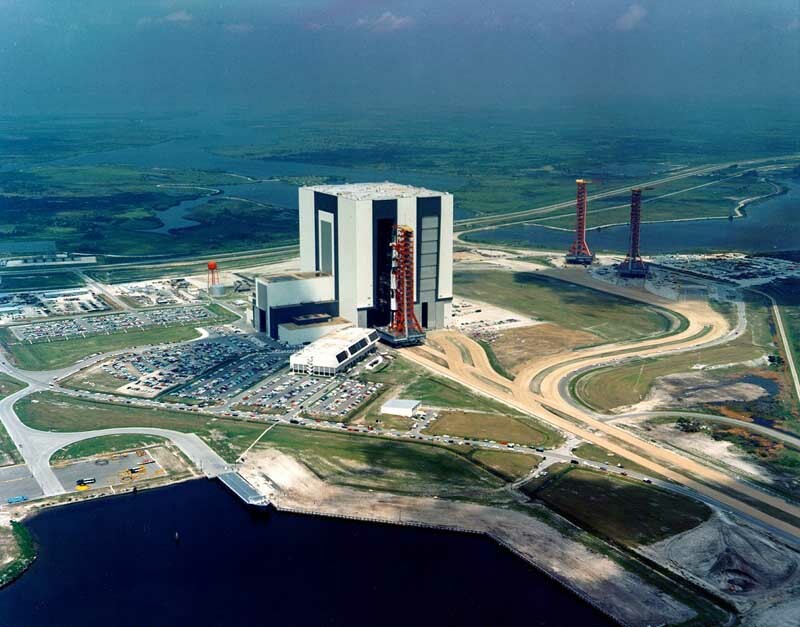 Rehearsal countdown at KSC for the S-IB/Apollo mission was delayed 24 hours on February 5 because of "minor problems and resulting crew fatigue." 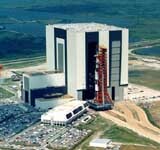 NASA spokesman said that it was not yet known if the delay would affect the rescheduled February 22 launching. 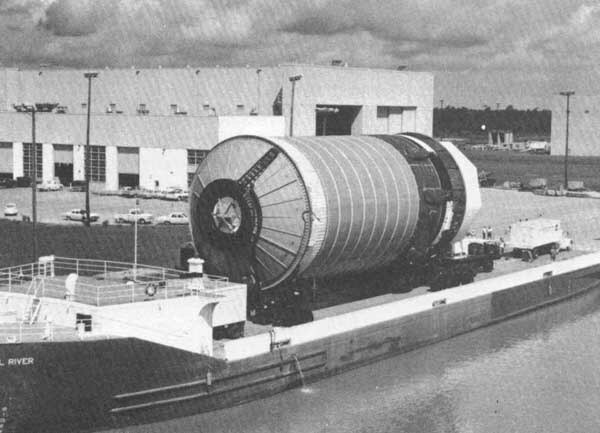 Meanwhile the S-IB stage for AS-202 arrived at KSC via barge where it was unloaded and transported to Hanger AF for receiving inspection and installation of three fins. 284. MSFC Saturn V Prog. Off., Saturn V QPR, Jan. 1-Mar. 31, 1966, p. 18. 285. MSFC Saturn V Prog. Off., Saturn V QPR, Jan. 1-Mar. 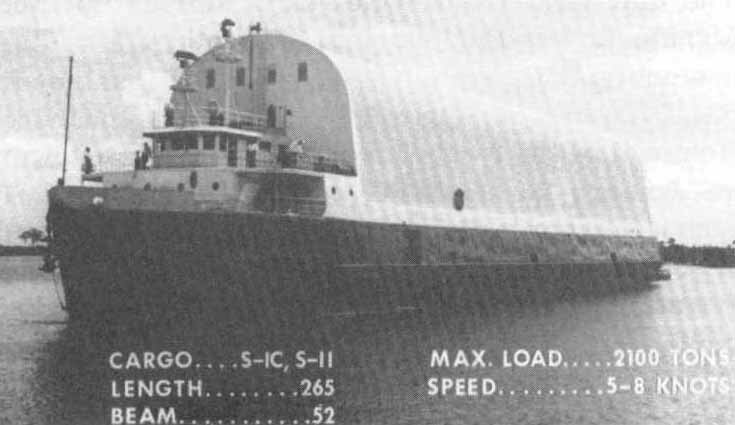 31, 1966, p. 38. 286. MSFC Press Release No. 66-39, Feb. 15, 1966. 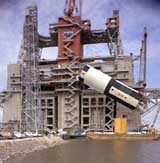 NASA's Saturn S-II facility stage (S-II-F) left Seal Beach, on February 20 for KSC aboard AKD Point Barrow. 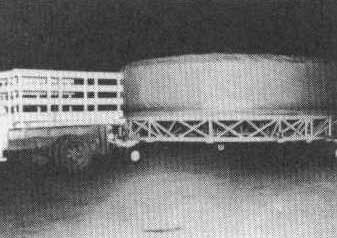 S-II-F, a nonflight version of the stage, would serve as second stage of the Saturn V facilities checkout vehicle, and would test and verify launch facilities, techniques, handling procedures, and operations. In a space hardware movement on the following day, the instrument unit for the second S-IB launch vehicle (S-IU-202) arrived at KSC from MSFC aboard the Promise. 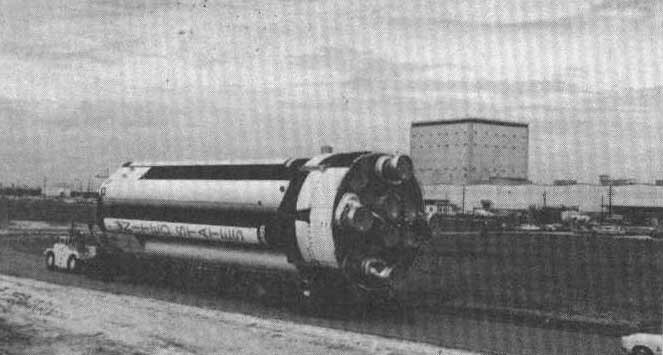 A booster for this S-IB was already at the KSC launch site. 287. 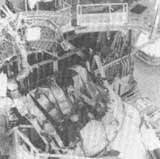 MSFC Saturn V Prog. Off., Saturn V QPR, Jan. 1-Mar. 31, 1966, p. 18. 288. MSFC Saturn V Prog. Off., Saturn V QPR, Jan. 1-Mar. 31, 1966, p. 11. 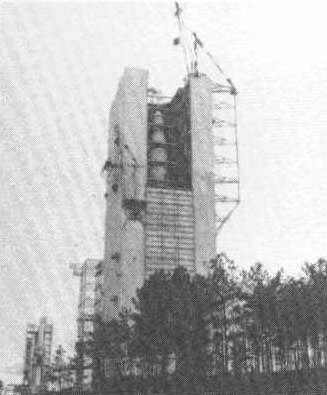 On February 28 at MSFC workmen moved the S-IB-5 into a static test stand in preparation for captive firings. 289. 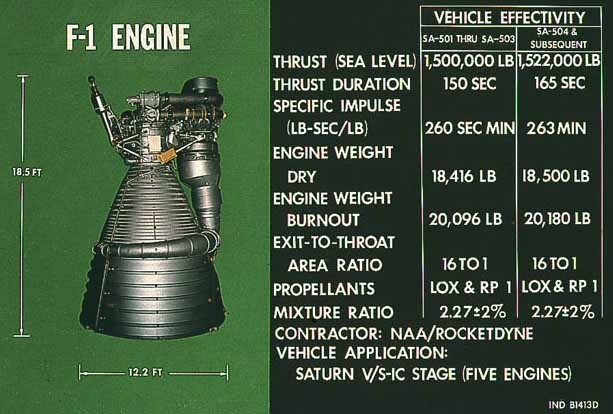 MSFC Saturn Flight Evaluation Working Group, Results of the First Saturn IB Launch Vehicle Test Flight AS-201 (MPR-SAT-FE-66-8), pp. 1-3. 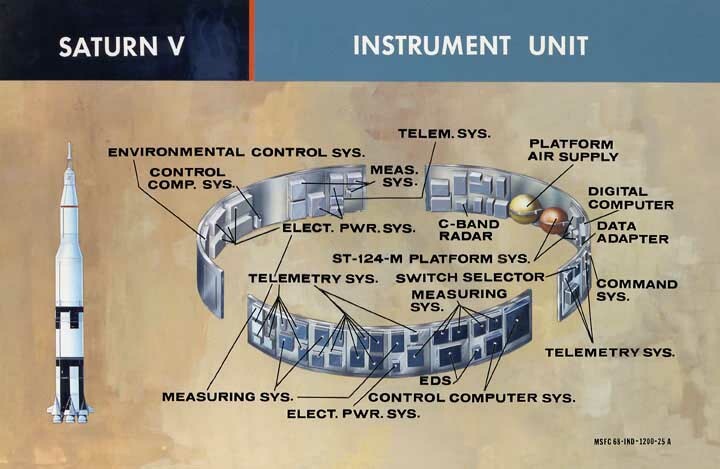 NASA signed with the Boeing Company a March 4 supplemental agreement converting the Saturn V first stage (S-IC) contract from a fixed fee to an incentive fee contract. It was the first Saturn stage contract to be converted to an incentive type. At the time of this conversion the Boeing contract was valued at $850,114,303.290 Also on March 4 the S-II-F stage and its interstage arrived at Port Canaveral, Florida. 290. MSFC Saturn V Prog. Off., Saturn V QPR, Jan. 1-Mar. 31, 1966, p. 27. 291. MSFC, MAF Hist. Report, Jan. 1-Dec. 31, 1966, p. 2. 292. 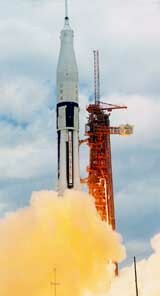 MSFC Saturn Flight Evaluation Working Group, Results of the Third Saturn IB Launch Vehicle Test Flight AS-202 (MPR-SAT-FE-66-13), p. 16. 293. NASA Hist. 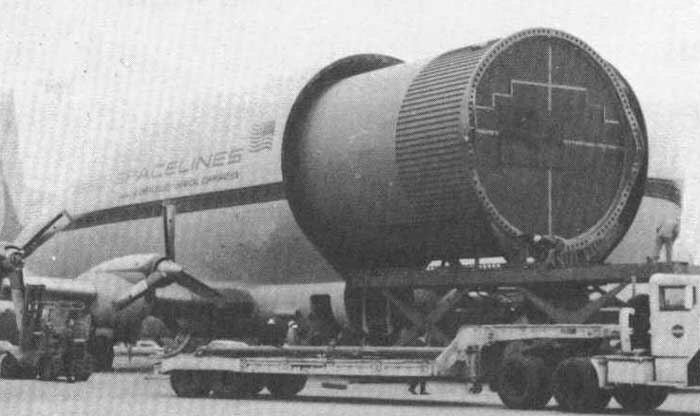 Off., Astronautics and Aeronautics, 1966, SP-4007, p. 107. 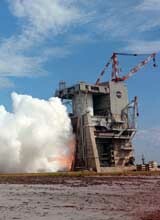 Mating of the S-II-F with the S-IC-F stage occurred at KSC, March 28. On the following day workmen mated the S-IVB-500F with the S-II-F, and the day after they erected the S-IU-500F. 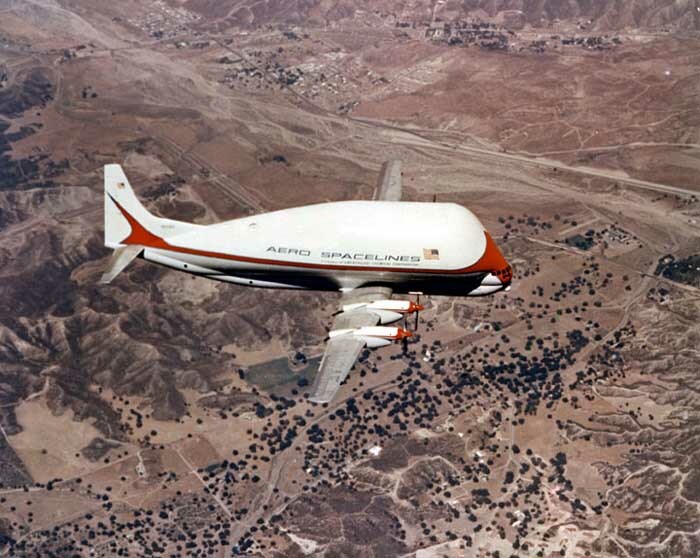 On March 30 the S-IVB-500S/T flew from California to MSFC aboard the Super Guppy. 294. MSFC, MAF Hist. Report, Jan. 1-Dec. 31, 1966, p. 3. April 1 NASA announced that project management of its first hydrogen-fueled engine, the RL10, was being transferred to Lewis Research Center at Cleveland, Ohio. 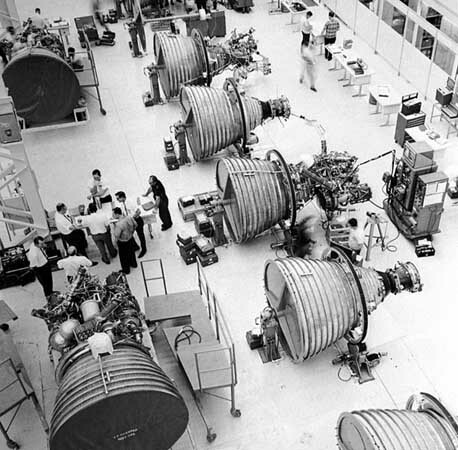 A cluster of six RL10 engines had powered the Saturn I's S-IV second stage before the conclusion of MSFC's Saturn I program the previous year. 295. MSFC Press Release No. 66-69, Apr. 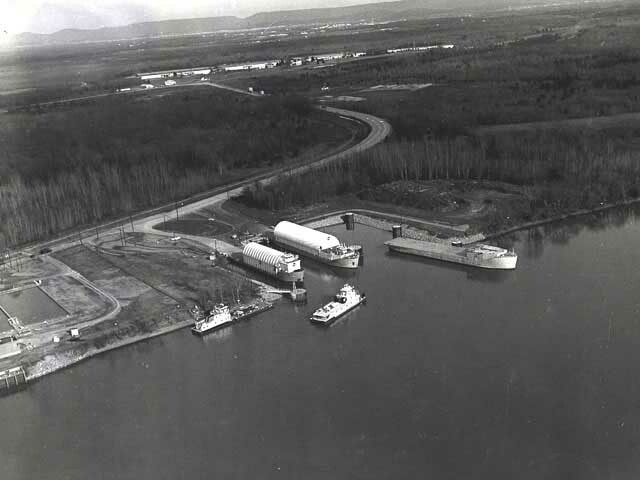 1, 1966. NASA announced on April 6 the purchase under a $7,634,742 modification to an existing contract of 22 additional H-1 engines for the S-IB launch vehicle. 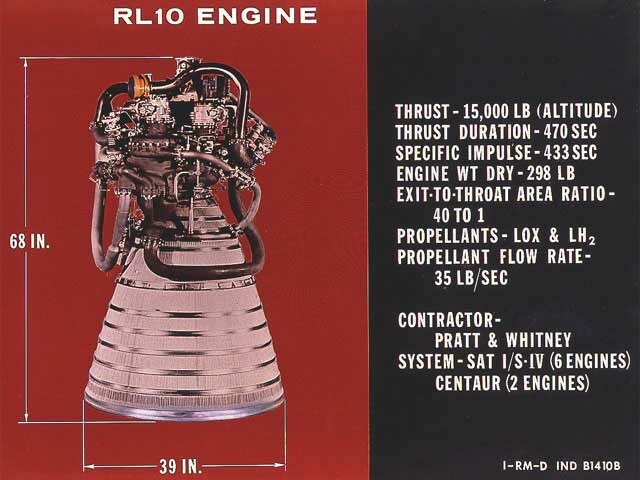 In addition to the engines the contract with North American Aviation's Rocketdyne Division called for three years of support services, including training, field engineering, and supply support. The third S-IB booster (S-IB-3) departed Michoud for KSC on April 7. 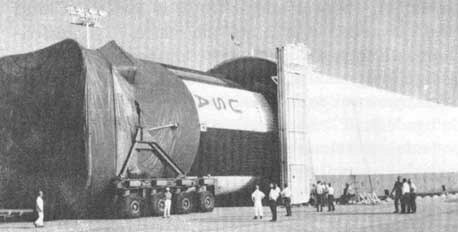 The S-IB stage for AS-203 arrived at KSC via barge Promise where it was unloaded and moved into Hanger AF on April 12. 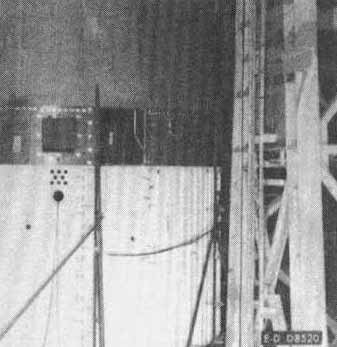 Six days later workmen erected the S-IB stage on Launch Complex 37B. Meanwhile, MSFC loaded the S-IB instrument unit for AS-203 aboard the Super Guppy for flight to KSC. 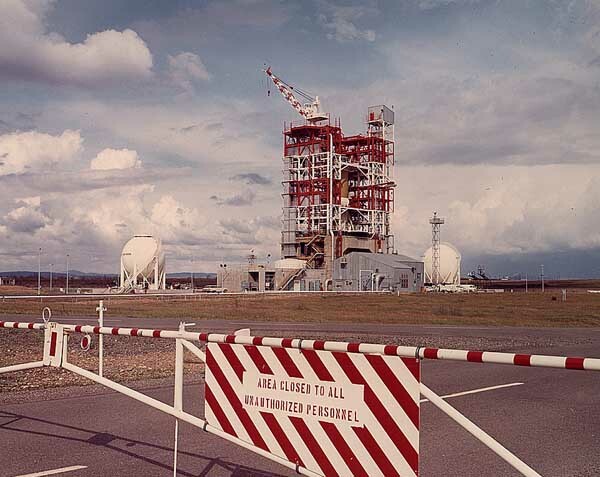 As preparations continued for erecting AS-203, KSC technicians continued propellant tests of the nearby AS-202. LENGTH CARGO COMP. 25ft DIA. 296. MSFC, MAF Hist. Report, Jan. 1-Dec. 31, 1966, p. 3. 297. 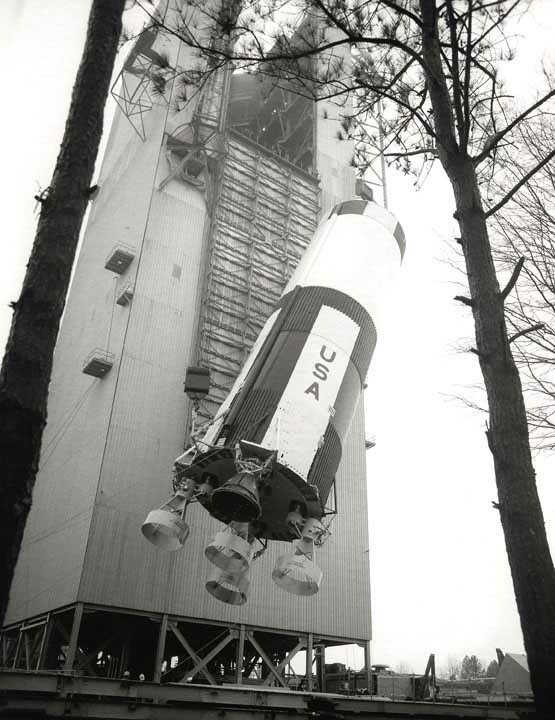 MSFC PAO, Marshall Star, Apr. 20, 1966, p. 1. 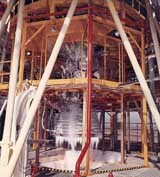 On April 23 workmen at MTF successfully captive-fired for 15 seconds S-II-T, the Saturn V second stage all-systems test vehicle. 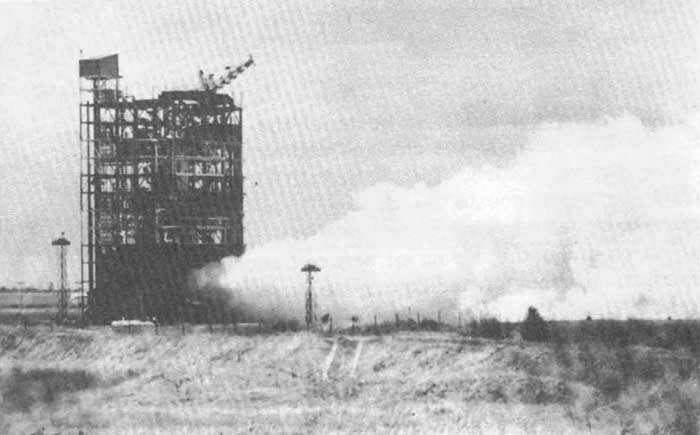 This was the first test of a flight-weight S-II stage. 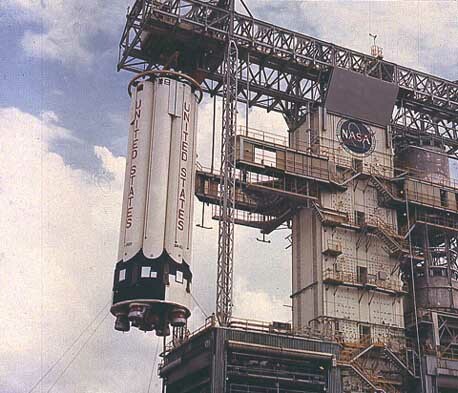 The stage, largest and most powerful liquid oxygen-liquid hydrogen stage known, developed one million pounds of thrust from its five J-2 engines. 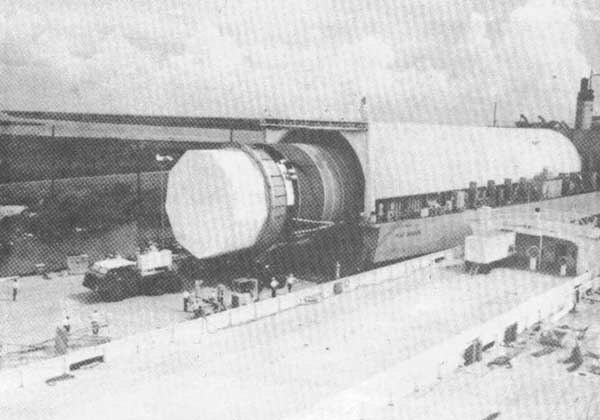 This test also marked the first operational use of MTF. 298. MSFC Press Release No. 66-83, Apr. 21, 1966. 299. MSFC Press Release No. 66-91, May 6, 1966. 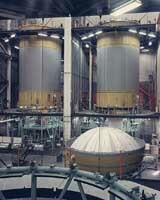 Helium-bottle trouble on May 10 resulted in termination of the second S-II-T firing at MTF. 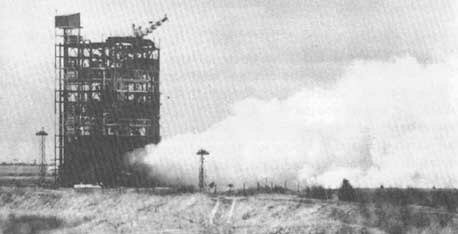 The following day, in a second attempt to complete a static firing of the S-II-T, the engine fired about 47 seconds. Premature cutoff occurred because of a gas generator problem. 300. MSFC Saturn V Prog. Off., Saturn V QPR, Apr. 1-June 30, 1966, p. 29. 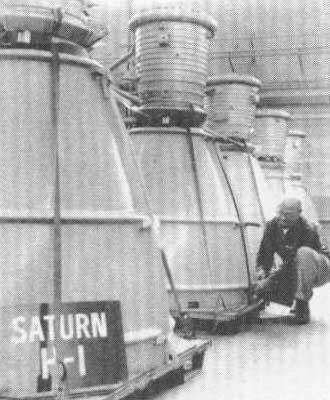 On May 19 MSFC announced the following nomenclature changes as recommended by NASA Headquarters officials, Dr. Seamans, Dr. Mueller, and Mr. Scheer: "Lunar Excursion Module to be called Lunar Module; the Saturn IB to become 'the uprated Saturn I.' At first the changes will be noted as 'the uprated Saturn, the Saturn IB' gradually dropping reference to the Saturn IB as the new name becomes more familiar. 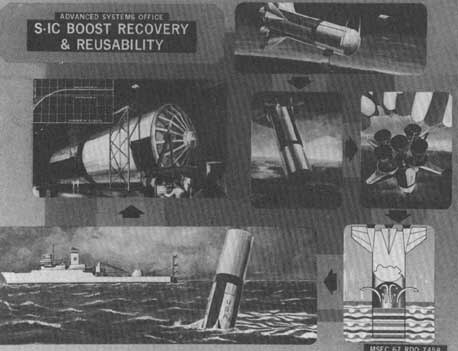 This would enable us to continue the string of Saturn I successes. 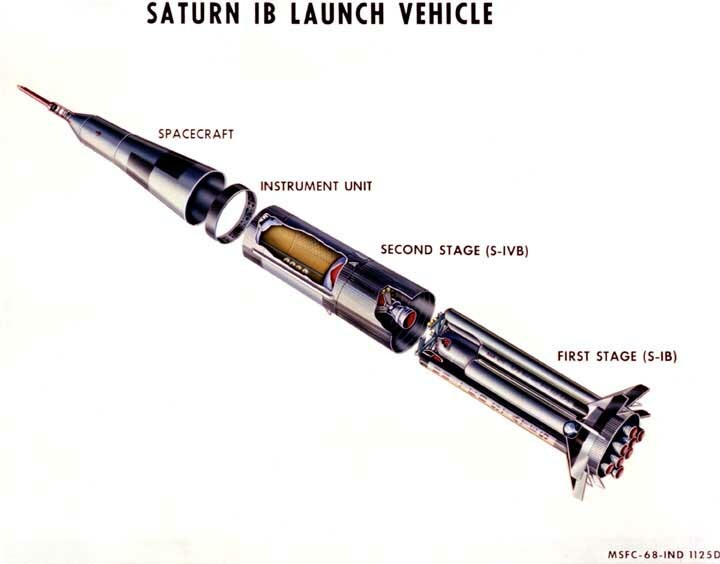 Realistically the uprated Saturn I is what we have anyway; in general public releases we should begin referring to Saturn stages simply as the first, second, or third stages, and, where helpful, to semi-technical press and in press kits follow with the technical nomenclature, ie., 'the third stage of the Saturn V (S-IVB),' etc. ; future releases and announcement should make use of the new nomenclature." 301. MSFC Saturn V Prog. Off., Saturn V QPR, Apr. 1-June 30, 1966, p. 19. 302. MSFC Saturn V Prog. Off., Saturn V QPR, Apr. 1-June 30, 1966, p. 19. 303. MSFC Saturn V Prog. Off., Saturn V QPR, Apr. 1-June 30, 1966, pp. 19 and 46. NASA announced on May 27 the selection of two firms for negotiations of parallel one-year study contracts for integration of experiments and experiments support equipment in space vehicles and spacecraft involving manned Apollo Applications missions. Estimated value of each contract was approximately $1 million. 304. MSFC Saturn V Prog. Off., Saturn V QPR, Apr. 1-June 30, 1966, p. 29. On May 30 the board released its findings after two days of inquiry. 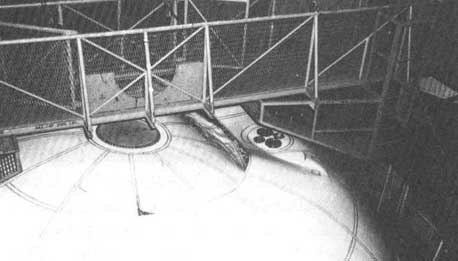 The fuel tank of the S-II stage had been pressurized beyond design limits. There was a need for tighter controls over MTF test procedure. 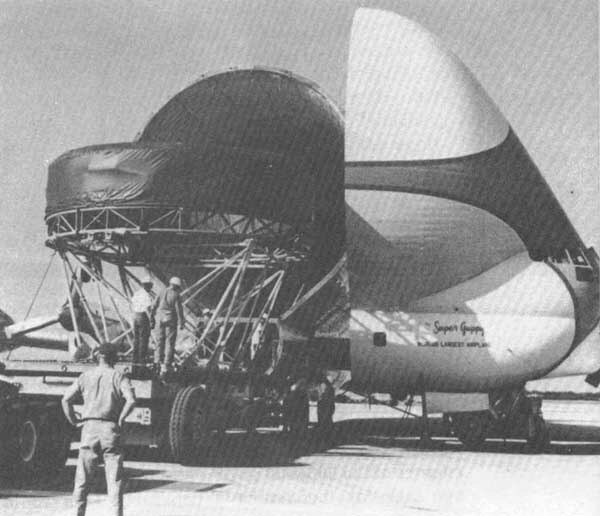 On June 1 the Saturn V third stage (S-IVB-502) flew aboard the Super Guppy aircraft from the Huntington Beach to SACTO for static testing. 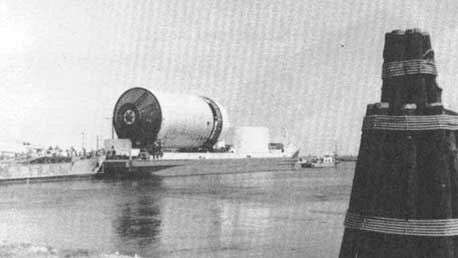 The 33,000-pound Saturn V upper stage, 59 feet long and 21.5 feet in diameter, was the second to arrive at the Douglas test site. 305. 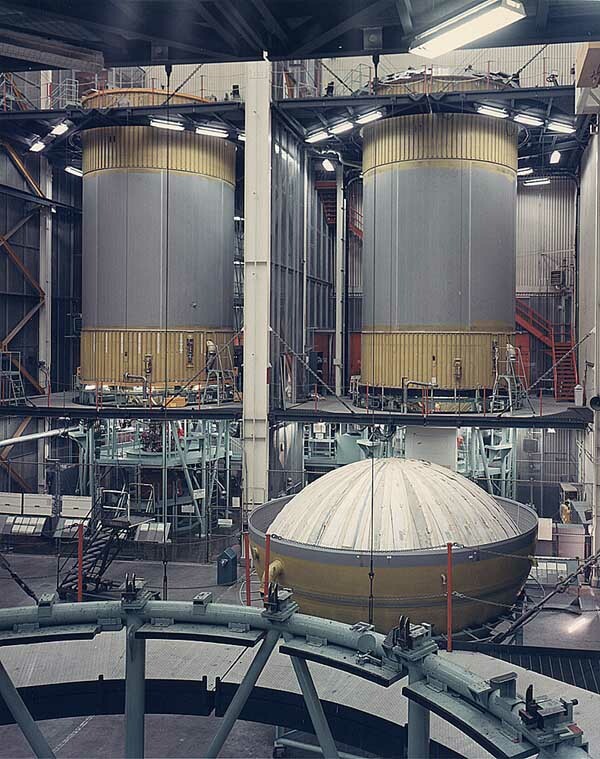 MSFC Saturn V Prog. Off., Saturn V QPR, Apr. 1-June 30, 1966, p. 19. 306. MSFC Saturn V Prog. 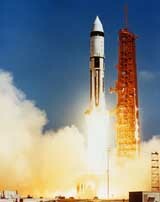 Off., Saturn V QPR, Apr. 1-June 30, 1966, p. 14. 307. MSFC Saturn V Prog. Off., Saturn V QPR, Apr. 1-June 30, 1966, p. 6. 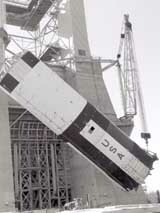 Following the destruction of S-II-T during a test at MTF, NASA extended the S-II battleship program until July of 1967. 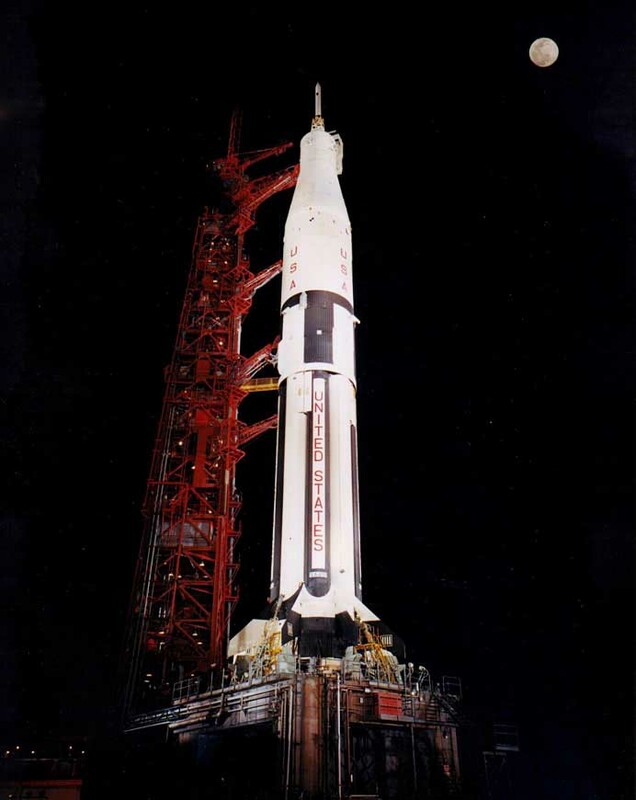 Also during June there were changes in the launch schedule for the Apollo/Saturn 203 launch. Previously scheduled for June 30, NASA rescheduled it for June 29 because of the scheduled launch of a lunar-anchored interplanetary monitoring platform Explorer. 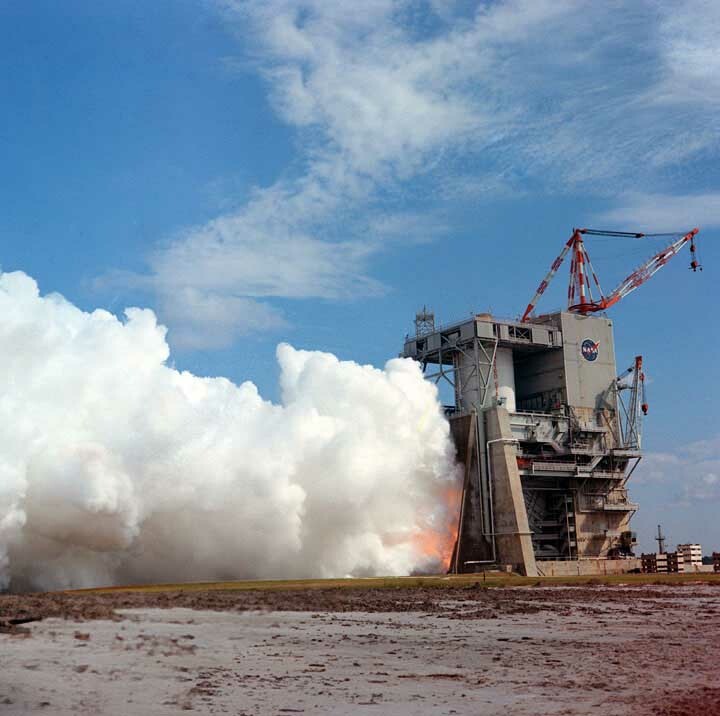 But by June 29 NASA had rescheduled AS-203 launch because of electrical problems, so that it would come no earlier than July 5. 308. MSFC Press Release No. 66-142, June 30, 1966. 309. MSFC, MAF Hist. Report, Jan. 1-Dec. 31, 1966, p. 4. 310. MSFC Saturn Flight Evaluation Working Group, Results of the Second Saturn IB Launch Vehicle Test Flight AS-203 (MPR-SAT-FE-66-12), pp. 1-3. 311. MSFC Saturn V Prog. Off., Saturn V QPR, Apr. 1-June 30, 1966, p. 25. 312. MSFC Press Release No. 66-152, July 8, 1966. 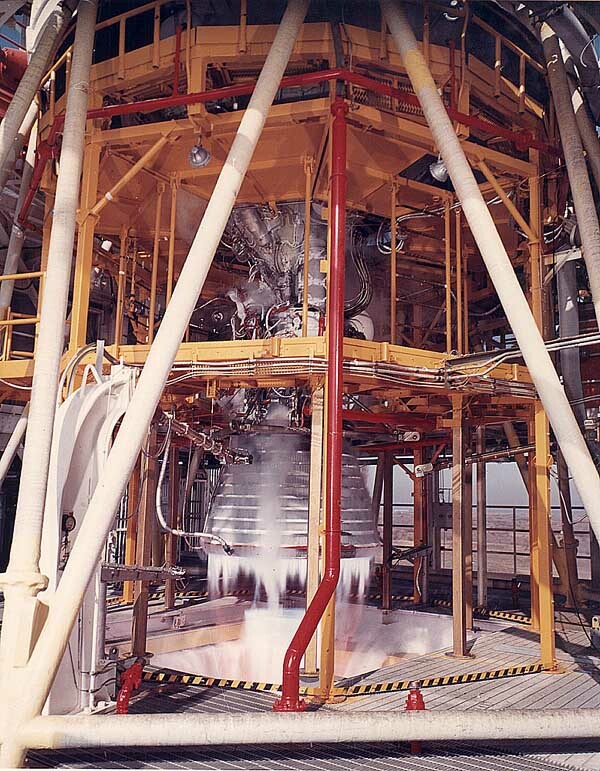 NASA Headquarters unconditionally approved J-2 engine program contract NAS8-19 on July 29. 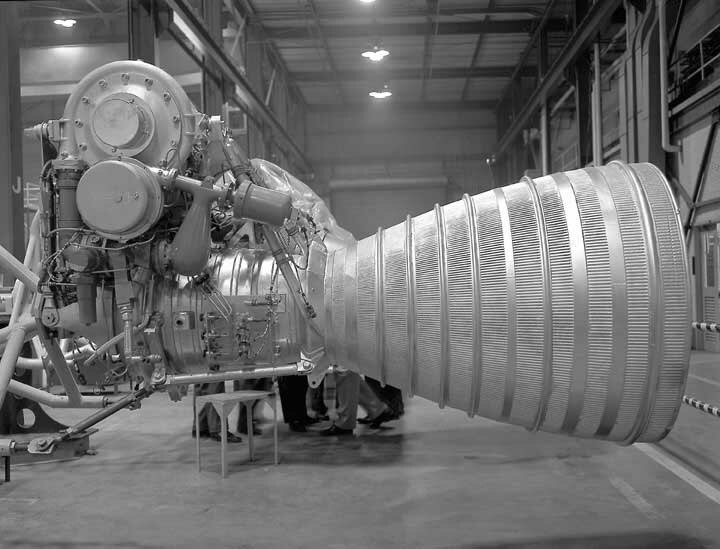 This contract established the provision for production support effort through December 1968, and for delivery of the 155 J-2 engines required for the Apollo program. 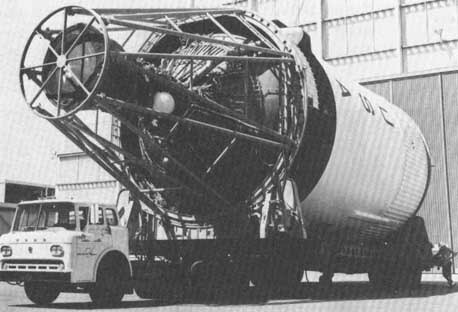 The contract combined what had been two major J-2 contracts.313 Also on July 29, technicians at Seal Beach made hydro-static tests of the S-II-3 stage for AS-503. At Santa Susana technicians conducted a 40-second mainstage test of the S-II battleship stage. Automatic cutoff initiated from engine number 5, but data revealed that cutoff occurred erroneously. 313. MSFC Saturn V Prog. Off., Saturn V Semiannual Prog. Report, July 1-Dec. 31, 1966, p. 56. 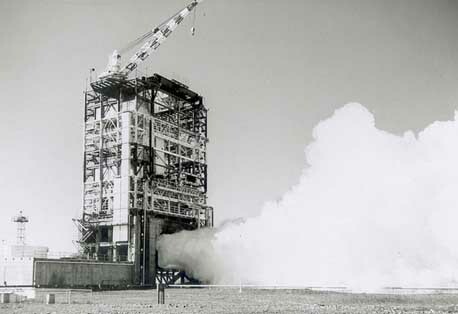 S-II-1, the first flight S-II stage scheduled for static firing at MTF, left Seal Beach on July 31. 314. MSFC Saturn V Prog. Off., Saturn V Semiannual Prog. Report, July 1-Dec. 31, 1966, p. 67. 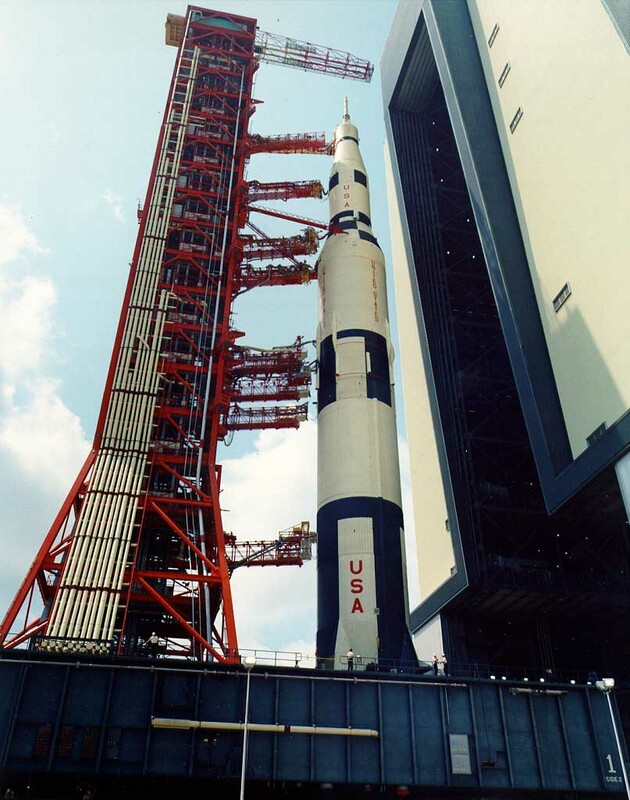 MSFC announced on August 5 the award of a $23.4 million modification to an existing contract with North American Aviation Space and Information Systems Division for additional work in building and testing the Saturn V launch vehicle's second stage. 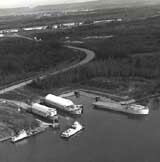 The contract modification included several engineering changes, many of which were already completed or under way. 315. MSFC MAF, Hist. Report. Jan. 1-Dec. 31, 1966, p. 4. 316. 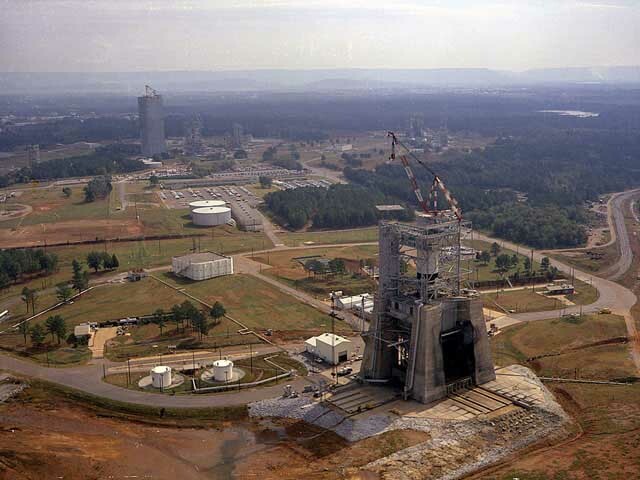 MSFC Saturn V Prog. Off., Saturn V Semiannual Prog. Report, July 1-Dec. 31, 1966, p. 54. 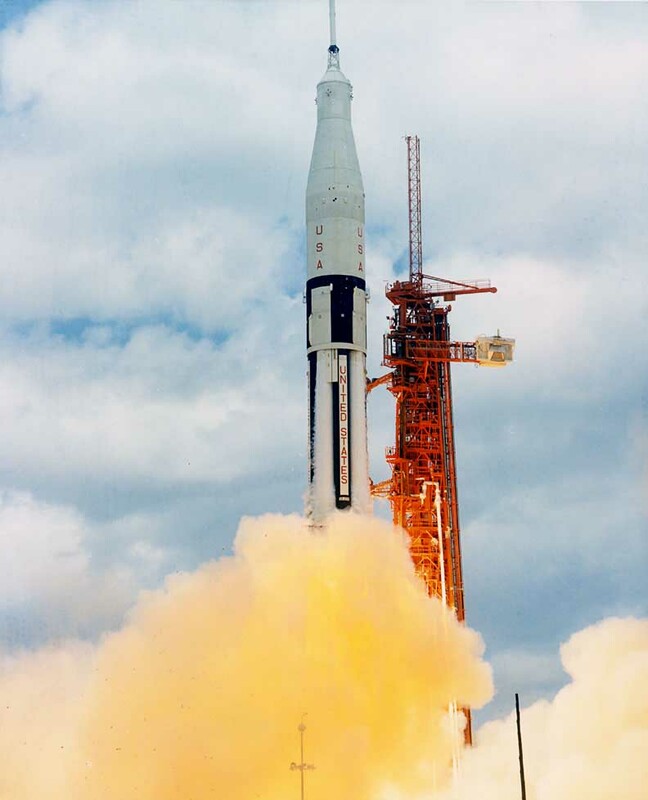 The fourth uprated Saturn I (S-IB-4), the first scheduled to launch a manned Apollo spacecraft, departed Michoud for KSC, on August 10. 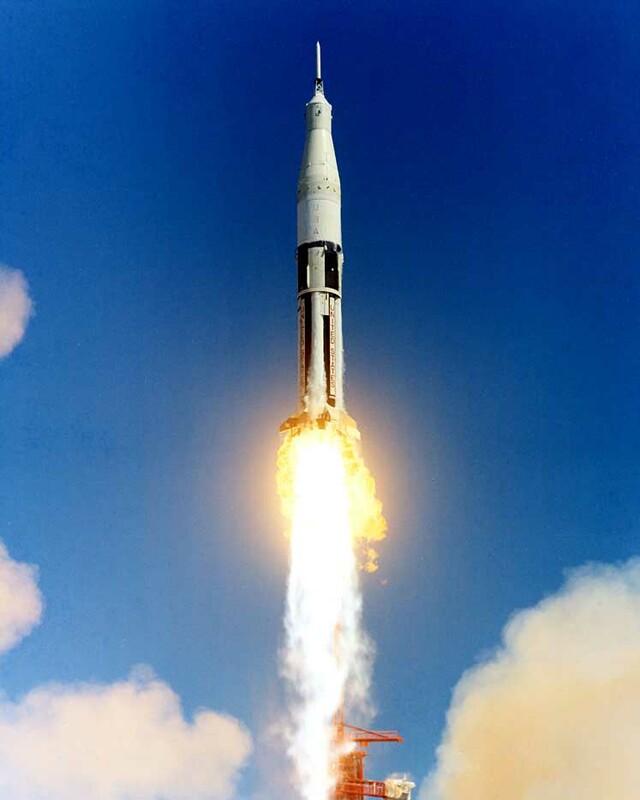 NASA announced on August 11 that MSFC would begin negotiations with the Chrysler Corporation and Douglas Aircraft Company for procurement of long-lead-time items for additional uprated Saturn I launch vehicles. Cost of the long-lead-time items was estimated at $5 million to $10 million. 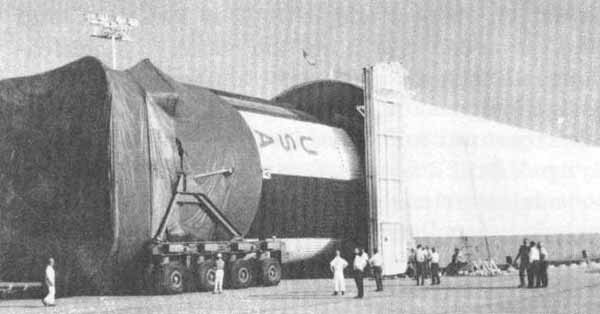 The first flight model (S-II-1) of the Saturn V vehicle's second stage arrived August 13 at MTF completing its 4,000-mile voyage from Seal Beach. 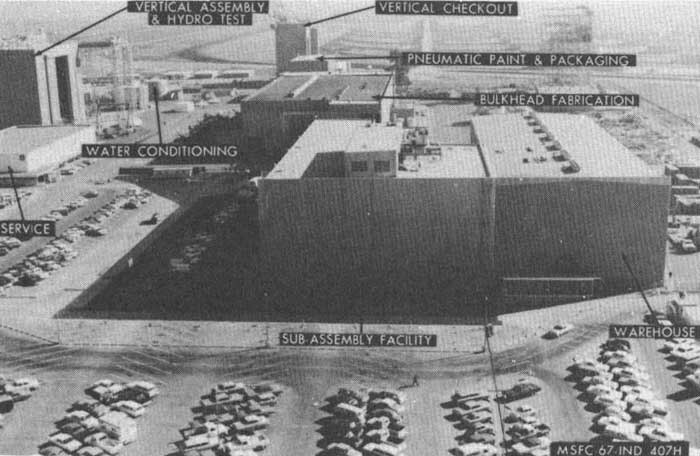 Workmen immediately moved the stage into the S-II stage service and checkout building for inspection and preparation for static firing. 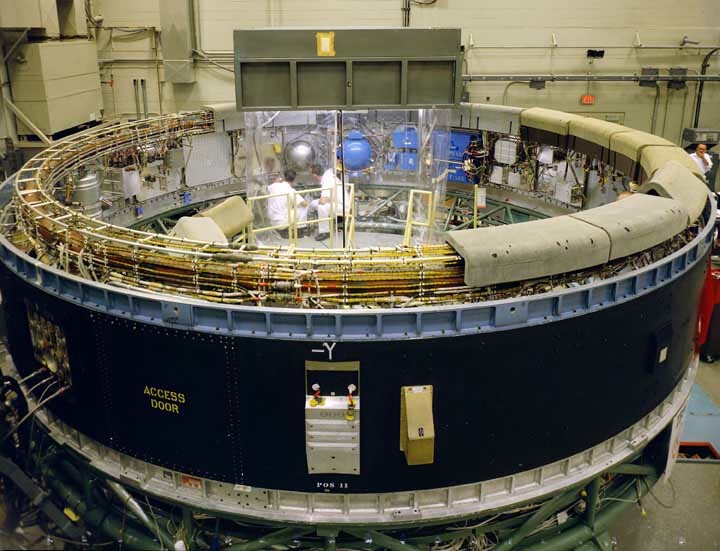 On August 19 NASA selected McDonnell Aircraft Corporation of St. Louis, Missouri, for negotiations toward a fixed-price contract estimated at $9 million to provide an S-IVB airlock. 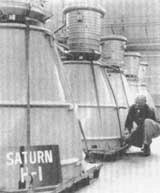 The airlock would permit astronauts access to the empty hydrogen tank of spent uprated Saturn I second stages. 317. MSFC Press Release No. 66-182, Aug. 10, 1966. 318. NASA Hist. Off., Astronautics and Aeronautics, 1966, SP-4007, p. 272. 319. MSFC Saturn V Prog. Off., Saturn V Semiannual Prog. Report, July 1-Dec. 31, 1966, p. 72. 320. MSFC Saturn Flight Evaluation Working Group, Results of the Third Saturn IB Launch Vehicle Test Flight AS-202 (MPR-SAT-FE-66-13), pp. 1-3. On August 26 MSFC shipped the first Saturn V flight booster (S-IC-1), scheduled to be launched early in 1967, to the Kennedy Space Center via the barge Poseidon. 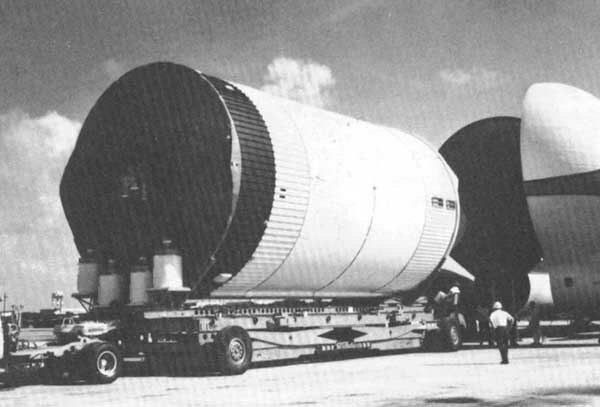 NASA announced on August 28 that the August 19 line rupture below the 900,000 gallon stainless steel storage tank for the Saturn V booster's LOX would delay the booster's first flight, scheduled for the first quarter of 1967, by at least 45 days. 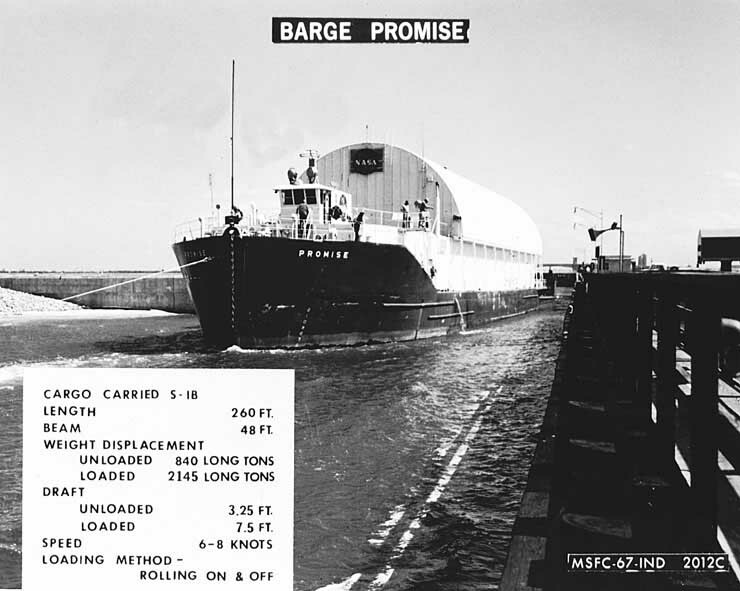 MSFC announced on September 7 that four barges carrying 400,000 gallons of vitally needed liquid oxygen were on route to KSC after being dispatched from MTF. The shipment, together with 40,000 gallons brought into KSC by truck and rail tank cars, would replenish the liquid oxygen lost on August 19 at Launch Complex 39. 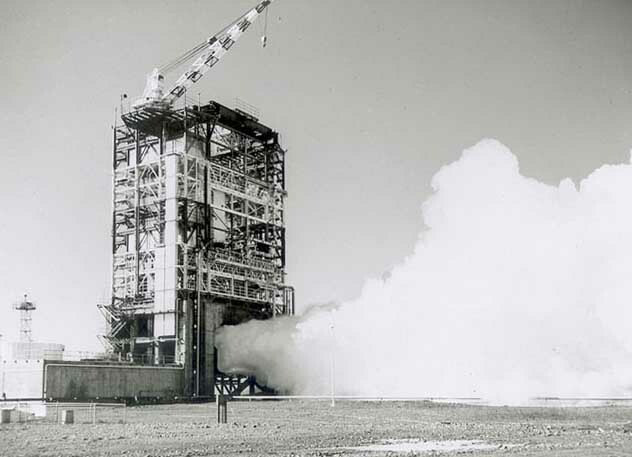 Schedules called for propellant loading tests to resume September 20, 1966. 321. NASA Hist. 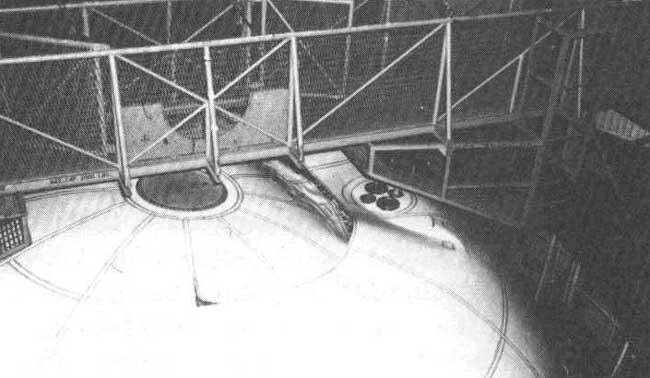 Off., Astronautics and Aeronautics, 1966, SP-4007, p. 277. 322. MSFC Saturn V Prog. Off., Saturn V Semiannual Prog. Report, July 1-Dec. 31, 1966, p. 26. 323. 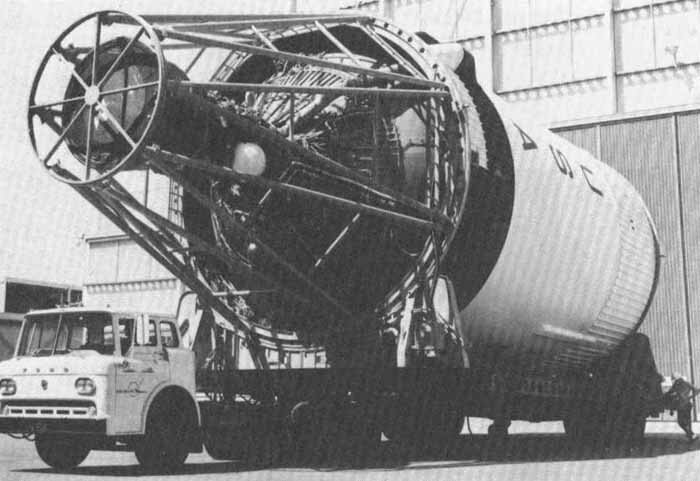 MSFC Saturn V Prog. Off., Saturn V Semiannual Prog. Report, July 1-Dec. 31, 1966, pp. 58 and 71. 324. MSFC, MAF Hist. Report, Jan. 1-Dec. 31, 1966, p. 5. 325. MSFC Press Release No. 66-223, Sept. 29, 1966. 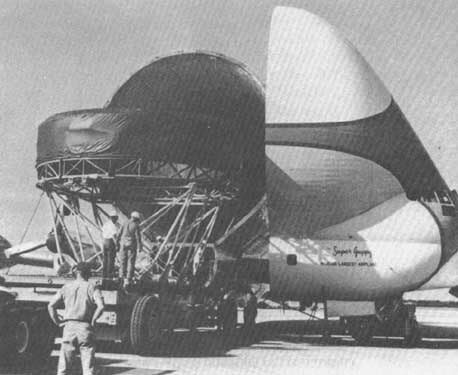 The S-IVB-503 stage went from Los Alamitos to Sacramento via the Super Guppy aircraft on October 11. 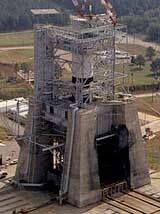 The stage moved to the Vertical Checkout Laboratory on October 12, and into the test stand on October 14. 326. MSFC Saturn V Prog. Off., Saturn V Semiannual Prog. Report, July 1-Dec. 31, 1966, p. 28. 327. MSFC, MAF Hist. Report, Jan. 1-Dec. 31, 1966, p. 5. 328. MSFC Saturn V Prog. Off., Saturn V Semiannual Prog. Report, July 1-Dec. 31, 1966, p. 72. 329. MSFC Saturn V Prog. Off., Saturn V Semiannual Prog. Report, July 1-Dec. 31, 1966, p. 30. 330. NASA Hist. Off., Astronautics and Aeronautics, 1966, SP-4007, p. 350. 331. MSFC Press Release No. 66-276, Nov. 17, 1966. 332. MSFC Press Release No. 66-278, Nov. 21, 1966. 333. MSFC Saturn V Prog. Off., Saturn V Semiannual Prog. Report, July 1-Dec. 31, 1966, p. 44. 334. MSFC Press Release No. 66-228, Nov. 30, 1966. 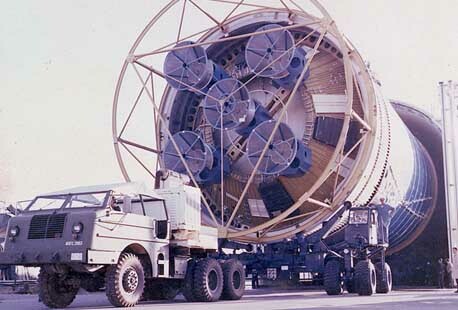 Workmen at MSFC completed stacking of the AS-500D vehicle on December 3. 335. MSFC Saturn V Prog. Off., Saturn V Semiannual Prog. Report, July 1-Dec. 31, 1966, p. 39. 336. MSFC Press Release No. 66-294, Dec. 13, 1966. 337. MSFC Saturn V Prog. Off., Saturn V Semiannual Prog. Report, July 1-Dec. 31, 1966, p. 25. 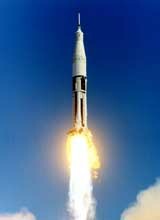 MSFC announced on December 28 that NASA had signed a $6,383,720 contract modification with the Missile and Space Systems Division of Douglas Aircraft Company for long-lead-time items for the upper stages of uprated Saturn I vehicles. The contract, to be managed by MSFC, was extended through June 1967. 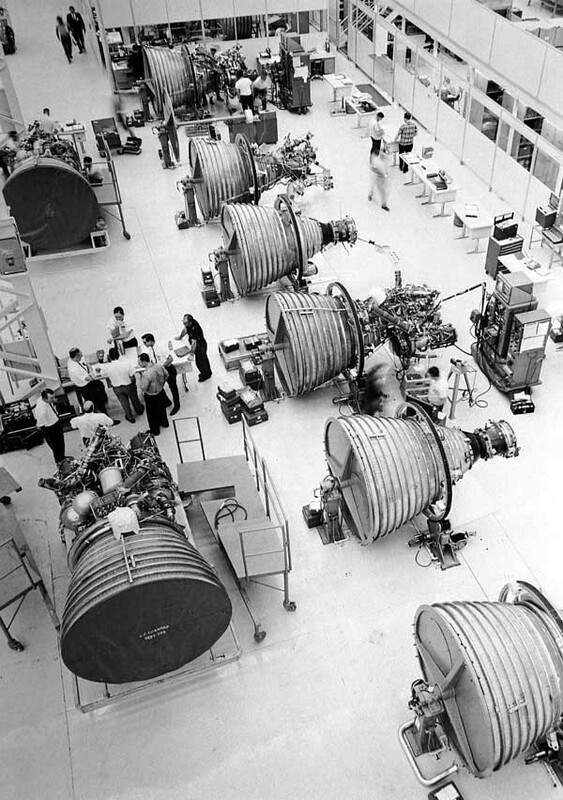 The object of the procurement action was to maintain the option of ordering additional S-IVB stages for the uprated Saturn I in the future, without suffering a delay in certain areas where considerable time might be required for material acquisition and/or manufacturing. 338. 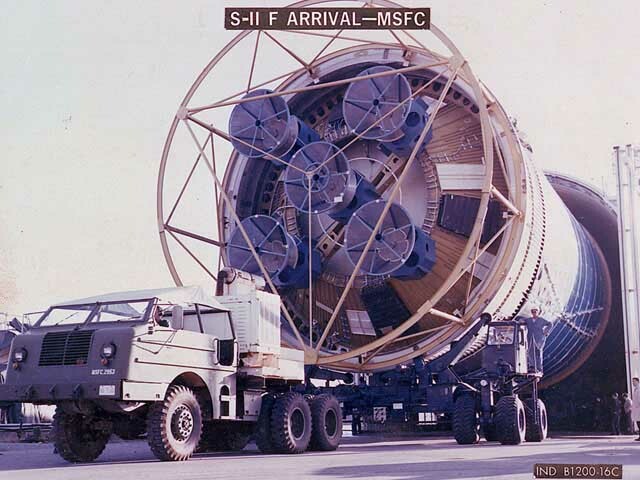 MSFC, MAF Hist. Report, Jan. 1-Dec. 31, 1966, p. 6.